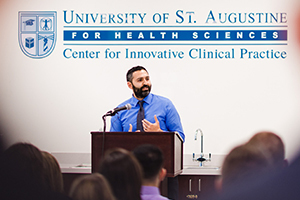 San Marcos, CA – May 4, 2017 – The University of St. Augustine for Health Sciences (USAHS), a leading graduate institution that emphasizes health and rehabilitative sciences education through innovative classroom education, is pleased to announce the opening of the new Center for Innovative Clinical Practice (ICP) on its San Marcos, CA campus. Through the use of simulation education, students are able to experience situations in immersive, realistic settings that require higher levels of critical thinking and soft skills, building confidence, experience and abilities in a safe space, and ultimately better prepare them for clinical work upon graduation. The ICP teaching laboratory spans nearly 7,000 square feet and allows for a broad range of physical therapy and occupational therapy classes in a hands-on learning environment. The Center provides various real-world settings for hands-on learning, including a 16-bed patient ward, a dedicated area for Occupational Therapy education, two patient assessment rooms which provide acute care and clinical scenarios, a complex simulation room, a 25 seat observation and debriefing room, and an activities of daily living lab with a kitchen, bedroom, dining, closet, bathroom and living area. The ICP has flexibility to adapt the spaces to meet simulation activity needs and includes state-of-the-art medical tools and resources that enable USAHS to educate the next generation of health care professionals. Simulation education’s hands-on approach is a proven curriculum technique, laying the foundation for success. The features of simulation which best facilitate learning include the ability to provide feedback, curriculum integration, repetitive practice and the ability to range the difficulty levels. Importantly, simulated, hands-on education is proven to improve professional confidence, patient safety, communication and interpersonal skills, and allows students to quickly build trust with patients and their families. For more information on the San Marcos Center for Clinical Practice contact Rachael Lighty at [email protected] or call (410) 218-6055. For more information on USAHS, please visit usa.edu.